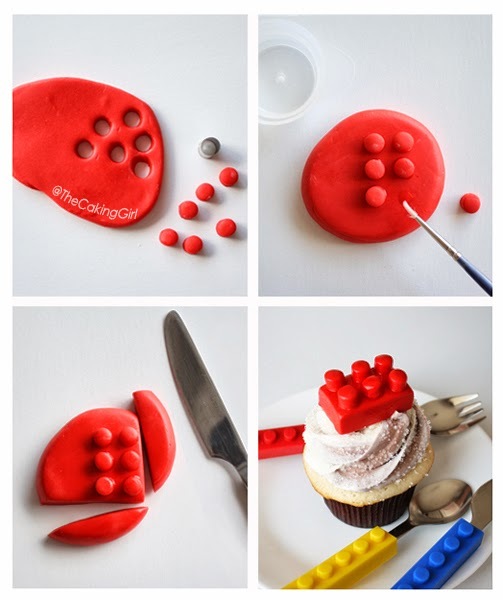 TheCakingGirl: Fondant decorating: How to make a LEGO CUPCAKE! 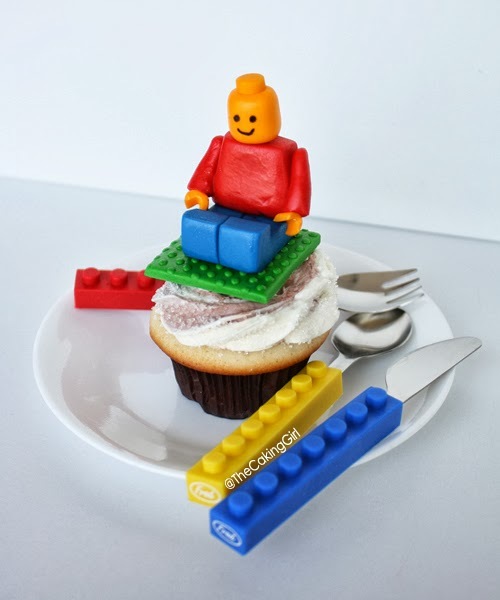 Fondant decorating: How to make a LEGO CUPCAKE! the green board so badly haha! I built furniture with them for my barbie dolls too. I LOVE LEGO! I was in Halifax over the summer and saw these lego cutlery in a kitchenware store!! 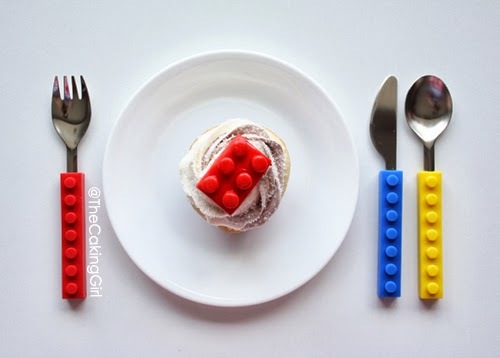 Of course, I had to make lego cupcakes and take pictures with the cutlery when I got home! ..and here's a lego man on a cupcake. He's made out of gumpaste, entirely edible! 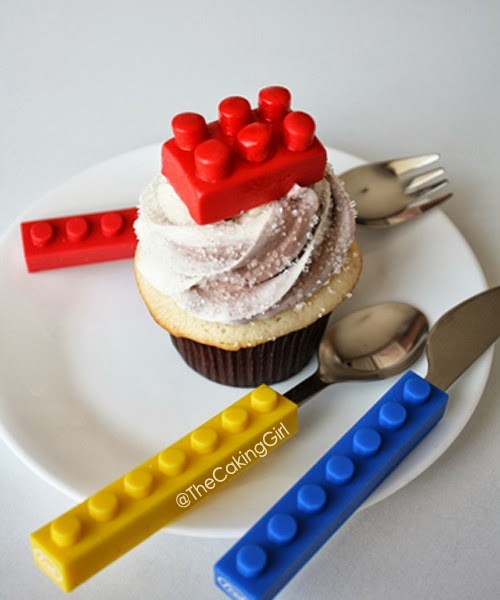 Easy DIY lego cupcake tutorial! 1. Use a toothpick and dab a bit of your edible color dye onto the fondant. Knead the fondant until the color is all mixed. You might need to add the color several times to get a nice intense color like the lego blocks. 2. Roll out the fondant about 3/4 of an inch thick. 3. Use the circle cutter and cut out 6 fondant circles. 4. Roll the fondant together and roll it out to 3/4 inch think again. 5. 'Glue' the circle fondant onto the rolled out fondant by dabbing a bit of water. The water acts as a glue between the fondant. I like using a small paintbrush to apply water, you can use your finger, or toothpick etc. 6. With the knife, cut a rectangular shape around the circles. 7. Let it dry for a few hours, and you can place them onto cupcakes! You can make variations by using different colors and different lego pieces (2 circles, 4 circles). "Fred and Friends Snack and Stack" lego cutlery. You can buy them online! The idea of the food and cooking is great and lots of people are currently working in this field. In this article, you give the good points with this https://australianwritings.net/ website and I like all these tips that you mention in this article. This is a mind-blowing and informative article.